Oh phooey! I had to cancel my orders for this AUD/USD trade because the pair started to move without me. Talk about missing the boat! Now, it’s just over 200 pips away from my entry point. AUD/USD rallied strongly yesterday after risk appetite improved in response to positive U.S. data. Concerns in Europe over Ireland’s debt woes seem to be subsiding as well, now that the Irish have expressed openness to take on loans. The cherry on top was RBA Deputy Governor Battellino’s comments yesterday, which suggest that the central bank may not be done with the rate hikes yet. If you think about it, it’s pretty clear why AUD/USD shot up so quickly. It’s just a pity I wasn’t able to join the party! The dollar has been rallying so much this week that it might need to take a break. Because of that, I think traders will soon treat the Greenback the way I treat those nasty calories. Time to shed some! I’m still keeping my orders open for my NZD/USD long trade idea from last week and adding a long AUD/USD position this week. But in order to keep with my risk management rules, I decided to risk a smaller position on the Aussie. Still, there’s no denying that the setup on the daily chart looks yummy. The rising trend line drawn connecting the pair’s lows since early August seems pretty solid, and AUD/USD could bounce after hitting that area. I put up some Fibs on the recent upswing and saw that the 38.2% retracement level lines up with a major support area at .9650. As for my profit targets, I’ll aim for the psychological .9900 handle first because that seems to be an area of interest. If you zoom in to the 4-hour chart, you’ll notice that it kept switching gears as support then resistance then support again. 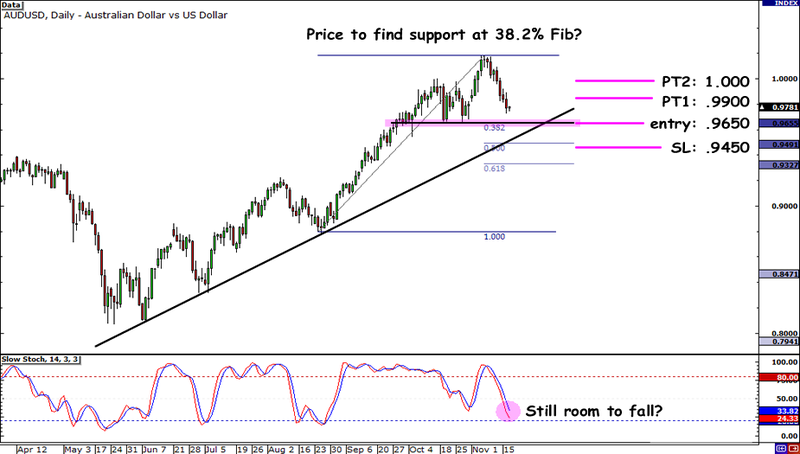 My next profit target is at parity since it could act as a strong resistance level for AUD/USD. As for fundamentals, I think we could see a midweek reversal. I’ve been doing a lot of reading and I read that Republican economists recently wrote a letter to the Fed asking the central bank to hold off on further quantitative easing. I think if we hear more about stuff like this, it could spur a reversal from the pair’s current price action. Also, you may have noticed that the markets have been in risk aversion mode in the past few days. Since this has already been going on for a while, I’m hoping that the underlying issues, such as Ireland’s debt problems, will soon be fully priced in and end AUD/USD’s fall. Later today, the U.S. is set to release hard-hitting reports such as CPI and building permits data. I have to admit, it has been hard to gauge how the markets will react to U.S. data lately. Still, any surprising results may just help me get triggered. 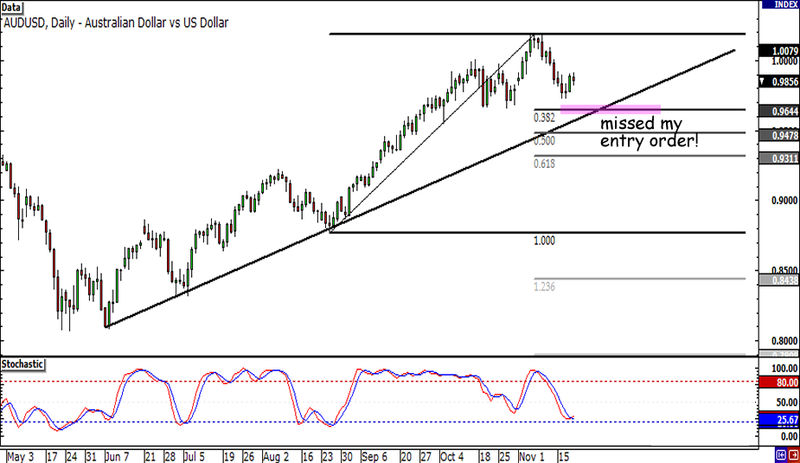 Long AUD/USD at .9650, stop loss at .9450, pt1 at .9900, pt2 at 1.0000. Since I still have open orders with my NZD/USD trade, I’ll just risk half my usual amount for this Aussie trade.